Every time it says 5km left, I re-fuel. Now I am expecting to re-fuel at least 16 of the 17l tank. Nope. I can only fill 13 or 14 before the fuel reaches the bottom of the funnel area. So , 4 liters remaining = 5 km left to empty??? My personal record is 17.3l in the 17.5l tank. That was after riding 303km on a single tank. The range had shown - - - for the last 2 km at that time. Overall it have been quite accurate for me. I think the most likely explanation for showing the same rsnge for a number of miles is that the furl gauge sender tops out some time before the tank is completely filled, until that fuel is burned off the brain will still think the tank is at the same level hence same range. This is exactly what's going on. This is the same in cars. It is normal for some reason. The 'range' displayed can vary for a number of reasons and is only really a guide and not an exact science. It mainly varies due to changes in how you drive / ride. It should calculate expected fuel range based on your riding style. If you've been riding conservatively for some time it will give you a nice big figure for expected range but if you then start winding the throttle right open - you'll see the range drop dramatically and certainly more quickly than you might otherwise think it should. 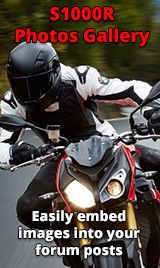 That is true, but of the many bikes and cars I’ve had with trip computers, the Germans are by far the best at using my real range rather than just how I rode the last 500’. My Concours 14 was really bad about that. The Germans aren't always bang on for range..
Well, there goes the assumption germans are ‘pünktlich’. I’m considering the same test for my bike. At least I will know what real range it is capable of. (I will take a spare liter of fuel with me). But on the other hand my VW always indicates an MPG figure 5MPG optimistic, but then we all know VW only have a passing relationship with the truth. VW uses also German math. For emission. Hence my comment about their relationship with the truth. I hope my Mercedes is more accurate (or at least not optimistic) because it struggles to get over 20MPG (and that's a full size imperial G).